It is remarkable how often the Palace appears to act as an apologist for Chinese transgressions on Philippine territory. In the latest example of this, Presidential Spokesman Salvador Panelo disputed a report saying that over 600 Chinese vessels have been circling Pag-asa Island, labeling this as an exaggerated claim. "The reporter made an exaggerated report by distorting the total number of Chinese fishing vessels monitored in the Pag-asa Island. She also used an alarming statement as 'Chinese vessels have been circling Pag-Asa Island',” he said. Quoting the Armed Forces, the Palace spokesman said “only” 275 Chinese vessels were spotted near the island from January to March—and that these were “stationary,” not circling the island. To find out the true status of these vessels, Panelo said, he would discuss the matter with Chinese Ambassador Zhao Jianhua. This is the same envoy who only recently said there were limits to where Filipino fishermen could go in our own waters in the West Philippine Sea, after he was confronted about their harassment by Chinese coast guard, in violation of an agreement by both sides to let fishermen navigate the South China Sea freely, except for marine protected areas. 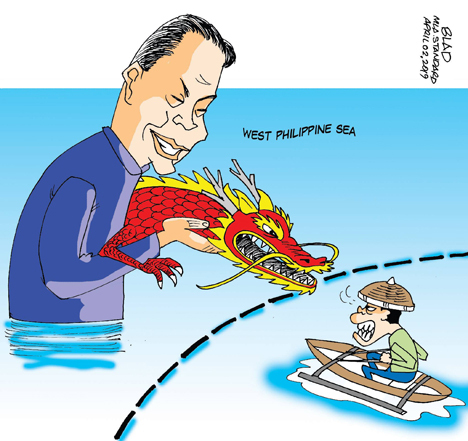 We fail to comprehend what possible reason the Chinese would want Filipino fishermen to stay out of our waters. Surely they do not comprise a security or any economic threat. On Monday, the ambassador said the Chinese were cooperating with their counterparts on the Philippine side to verify the truth of the latest report, saying that as far as he knew, there were fishermen on both sides. Whether these were 600 or 275, he said, was up for verification, but said all these vessels were manned by “fishermen”—despite consistent reports of a Chinese coast guard presence. "We have to verify media reports whether they are authentic or not. That's the first step. If they are true, I'm sure both sides can handle the issue through diplomatic channels in a friendly manner," Zhao added. Amid all this, the Palace says the country has filed a diplomatic protest against the presence of the stationary Chinese vessels. Given this administration's penchant for appeasing Beijing, however, we cannot say how vigorously such a protest will be pursued. This is, after all, the same administration that set aside the country's legal victory over China when a UN tribunal ruled in July 2016 that Chinese claims to the South China Sea were excessive, and that the Philippines has exclusive sovereign rights over the West Philippine Sea. We are still waiting for this government to exercise those sovereign rights on our behalf, instead of quibbling about whether the hundreds of Chinese vessels are circling our island, or merely posted around it in a stationary manner.